Below is an excerpt from our Week 9 newsletter, 2015. 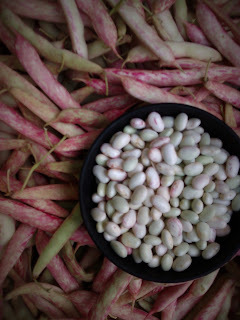 These beautiful Taylor Dwarf beans will make a hearty meal for your family, without a doubt. They are a shelling bean, meaning they are fresh beans you must remove from the pod and cook to achieve their ultimate, buttery bean deliciousness. We think eating shelly beans in our modern industrial society is a revolutionary act. It wasn't long ago that people grew beans like these on their land every year. Some of you can probably tell the story of going to Grandma's, picking some beans into buckets with your siblings or cousins, and then sitting on the porch and shelling them before they were cooked into some sort of great feast for the entire family. Unfortunately, this sort of gathering is rare these days—and with its absence we forget some of what it means to exist as a human family with purpose. Beans are a sustaining food. They are loaded with protein, they can be easily preserved for the cold months when nothing grows, and they fill your mouth and belly with satisfaction. But there's something special about those beans when you take them fresh off the plant and remove them from the pod that protected and nurtured them for months of growth. There's a satisfaction in getting the family together to split those pods down the middle, slide those beans out into a large bowl, and watch the goodness that will soon become dinner pile up. The first couple beans might present some difficulties, but with each one, your shelling technique gets better, and soon you're freeing the beans with ease, barely even thinking about what you're doing. The conversation among shellers takes center stage, and before you know it, you've filled the bowl to the brim. We believe eating like our ancestors is a vital part of being human. Preparing and eating beans might be one of the best ways to take us partially back to the days when food was work, and when people were forced, by the very nature and makeup of that locally grown food, to consider what it took to get that food to the plate. It's easy to take a can of beans off the shelf of the grocery store, bring it home, and pour it in a pot. But where's the satisfaction in that? When you shell your Taylor Dwarf heirloom beans (a variety that dates back at least to the 1700s), you won't only be preparing to eat history, but you'll be living it. We hope you enjoy the task as much as the food.